The good folks at Pause Design have a great photograph on their home page showing just how that printing technique is accomplished. I wanted to share that with you so you could visualize how the magic is done. 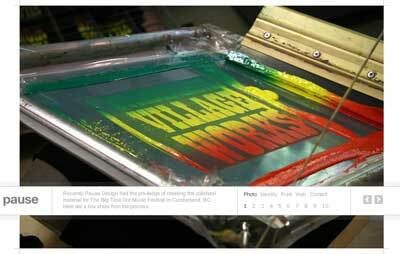 Once the color palette is laid down on the screen, the printer runs the squeegee horizontally as opposed to the typical vertical pass. Of course it can be done vertically as well but that wouldn’t be right for the image above. Voila! Some of the colors mix, most stay solid and you have one beautiful design in the end. Special thanks to Pause Design for having such cool images. Exclusive TV Store Online Tee Giveaway!